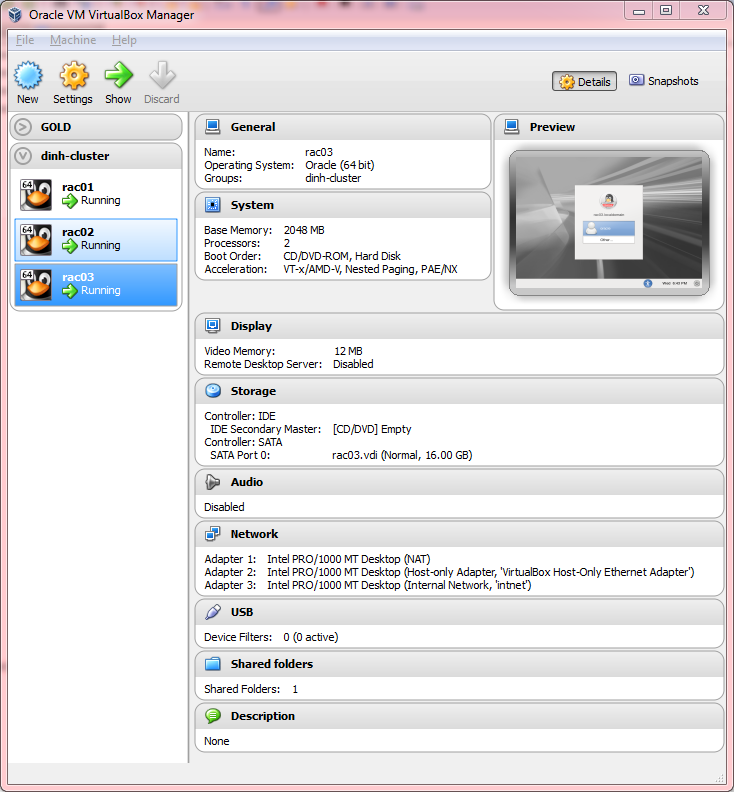 No, this is not another post on how to install RAC on Virtual Box. Instead, it is a post on my mistakes and notes so that you don’t make the same. Use generic name for volume group. Otherwise, rac02 clone will have vg-rac01. PING rac01 (192.168.56.11) 56(84) bytes of data. PING rac02 (192.168.56.12) 56(84) bytes of data. PING rac03 (192.168.56.13) 56(84) bytes of data. PING www.google.com (74.125.224.178) 56(84) bytes of data. !!! BACKUP!!! I FUBAR the install where ASM disks were listed as MEMBER versus CANDIDATE. !!! BACKUP!!! Now’s a good time since everything looks good. Next step is to create ASM disks. 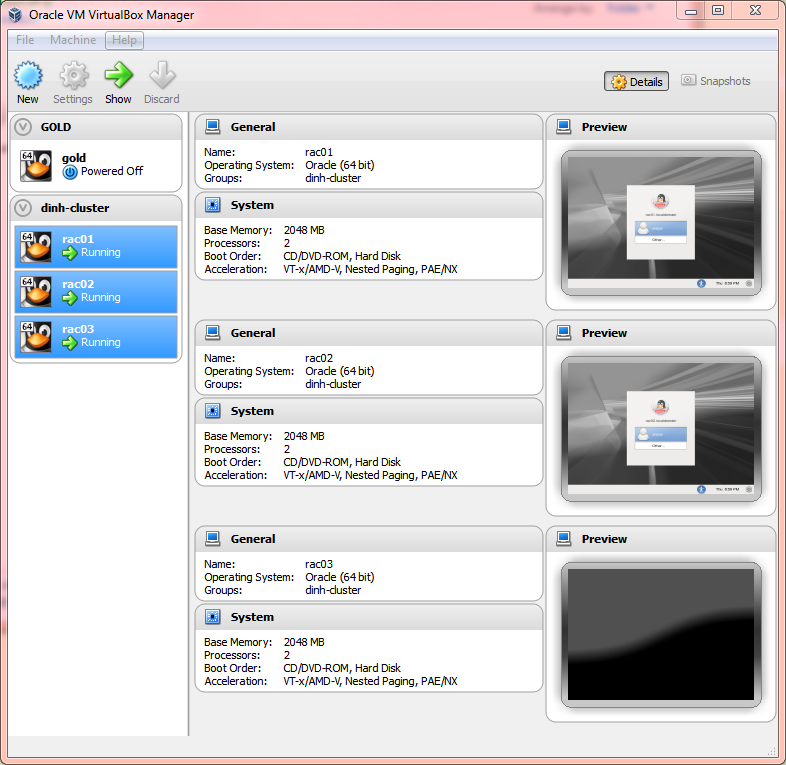 Best way to backup, shutdown VM copy ALL folders to new directory. To restore, copy everything back. Does not get easier. Some times I feel like GUI, some times, I don’t. VERIFY ASM DISKS FOR ALL NODES – TRUST ME! YOU DON’T WANT TO FIND OUT AFTER THE FACT. NOTE: I tried to install everything under oracle and was struggling. If I am going to create a environment, then why not create it production like! 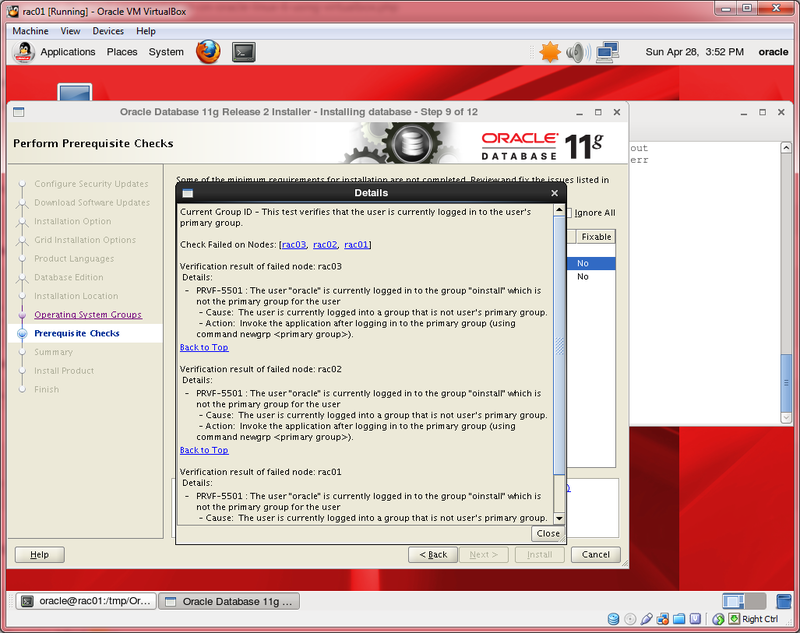 Using grid and NOT oracle for grid infrastructure instal. Just don’t cut and paste and follow. Do some digging and googling. Please specify a valid and existing cluster configuration file. Face it. Not every system is going to be perfect. !!! Primary group for grid must be dba, not oinstall for my 11.2.0.3 !!! !!! Must let root.sh complete on the first node, then parallel !!! What’s my cluster and scan listener? 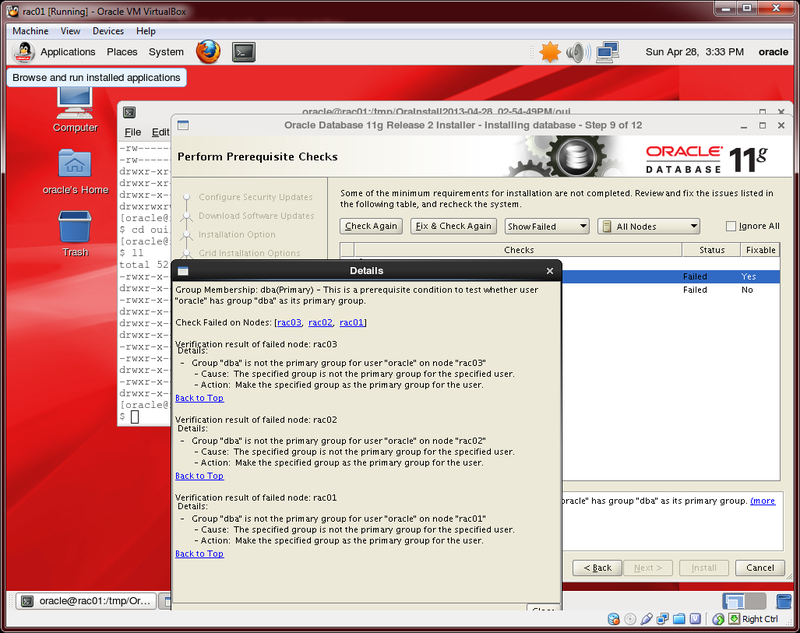 -v Run in debug mode; use at direction of Oracle Support only. The SRVCTL config command displays the configuration for the object stored in the OCR. I proceed to install database software and received insufficient space error. There was only 4GB left and that not enough since software requires 4.7GB if memory serves me correctly. After some digging, yum was taking up some space. Even Document 1442768.1 – RACGuide: 11.2.0.3 RAC Installation on Linux [Video] add oinstall as primary. PRIMARY GROUP NEEDS TO BE DBA for my 11.2.0.3 – VERY STRANGE. LOGOUT and LOGIN again; otherwise, error as shown below. Run raccheck and modify accordingly. I have followed this wonderful post to get a 2-node RAC working but after a week, I am still stuck at being able to ping the other node. PING dap-rac1.localdomain (169.254.36.101) 56(84) bytes of data. Please check your gateway. Are you able to ping dap-rac2 from dap-rac1? Could you please seme me the details of the ifconfig -a from your nodes. I reckon it is an issue with nework config but I can’t figure out what the problems is. I don’t think private IPs are ping-able. Don’t have access to my system at the moment. [root@rac02 ~]# cat /etc/sysconfig/network-scripts/ifcfg-eth# to review eth configuration. With your help and others mainly oraclebase.com, I have now installed my 2 node rac which I can now explore and hopefully, it will boost my chance for getting another job. I followed different notes which didn’t work for me for reasons which are network related but yours….having NAT,Host-only and internal adapter with the IPs appears to be the one that worked for me. Thanks for the feedback and I am glad that it helped.